Patio Sets come in different shapes, sizes and types, for most they are an important piece of outdoor furniture; offering valuable outdoor living space for families and friends to enjoy in the Summer months. 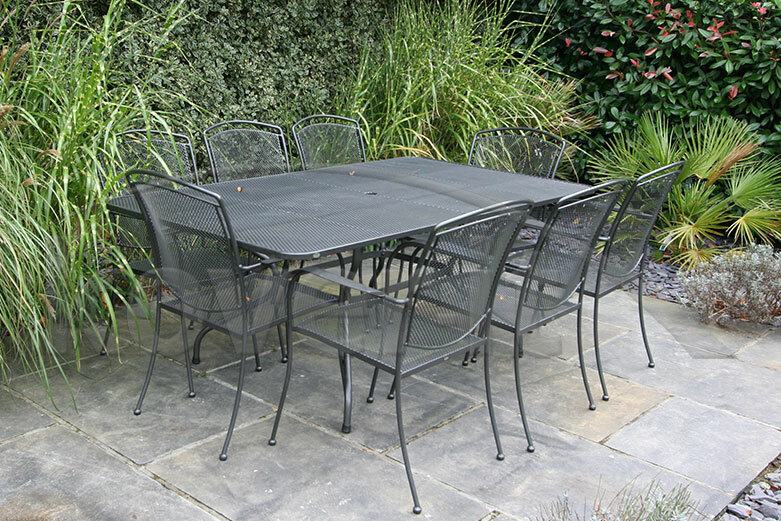 Therefore it is important patio sets are protected throughout the year, without the proper protection patio sets can easily become damaged and short lasting. Since a high quality patio set is not cheap, it is important you invest in a high quality protective Patio Set cover which will last as long as your furniture, as well as fit your patio set well. You need to ensure when covering your Patio Set it is protected from all the elements, rain, snow, frost, wind, dirt, grime, the suns damaging UV rays. Kover-it specializes in offering optimal protection all-year round for outdoor garden furniture, and manufactures heavy duty Patio Set Covers which offer protection from all of the elements. Kover-it manufactures their waterproof Patio Set Covers out of PVC-ST, which is extremely strong, durable, completely waterproof, UV resistant, easy to clean, and long-lasting. PVC-ST is so strong and long-lasting it is the same textile they use for lorry side curtains. Able to cope at temperatures of plus 70 and minus 30, Kover-its PVC-ST outdoor protective Covers are used all over the world even in more diverse and extreme weather, for example places such as Switzerland, Iceland, and Barcelona. Above is an image of one of Kover-it’s high quality Patio Set covers, it was custom made to the customer’s measurements, and fits the patio set well. Having a custom made patio set cover ensures the patio set is properly protected, as it is not just the textile that is important for protecting your furniture; size and design is just as important. If a cover is too small then parts of your furniture will be exposed thus getting damaged, or if too big the cover will be baggy thus dragging on the floor, a baggy cover can also have the risk of being blown away as it can act like a balloon and air can get trapped underneath. 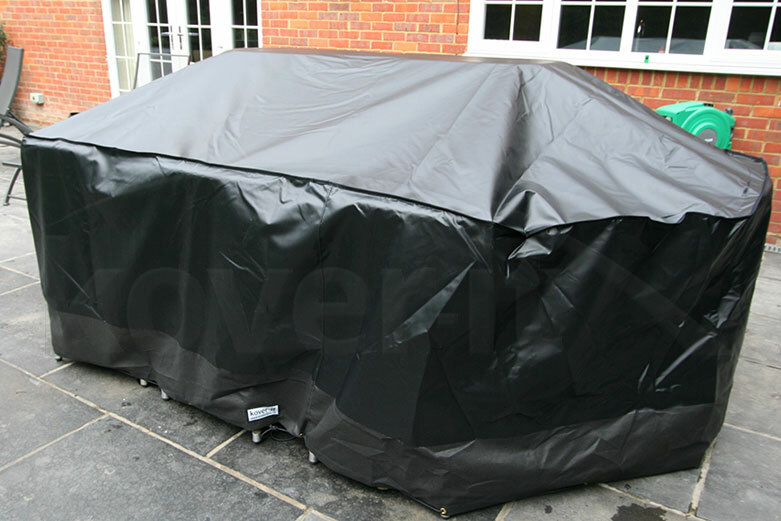 Having a cover too big also means when the wind picks up it will move the cover more, and constant chafing of the cover on the furniture could damage the cover especially if it is not made out of a strong durable textile. The owner of this Patio Set also wanted to protect the glass table from scratches and scuffs, so in addition to the heavy duty Patio Set Cover, they also had a custom made protective table top cover. 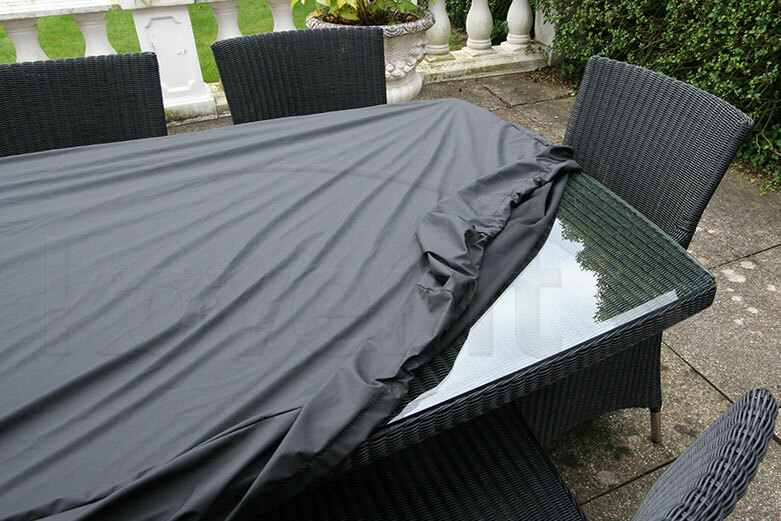 Kover-it manufactured the table top protective cover from PVC backed Polyester as it is a soft lightweight textile, which has a waterproof backing. It also has an elasticated edge to make it easy for the cover to be put on and off. 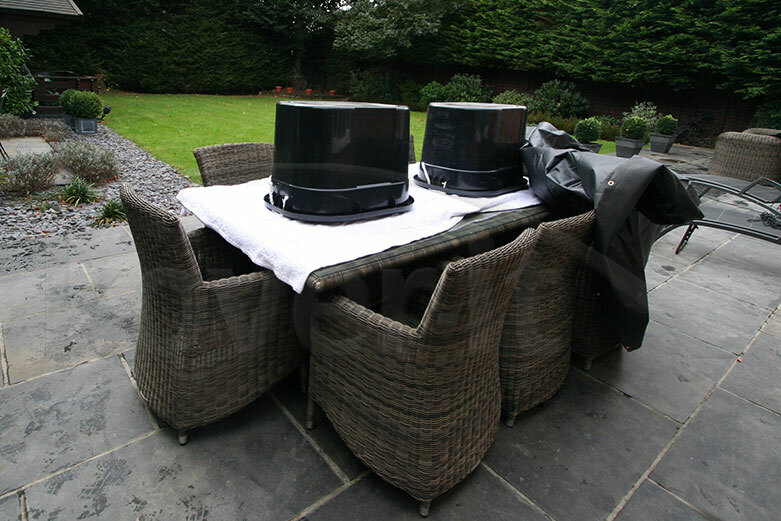 When covering any Patio Set where the chairs are higher than the table like this one, it is important to place something in the middle of the table to prop the cover up in the centre. 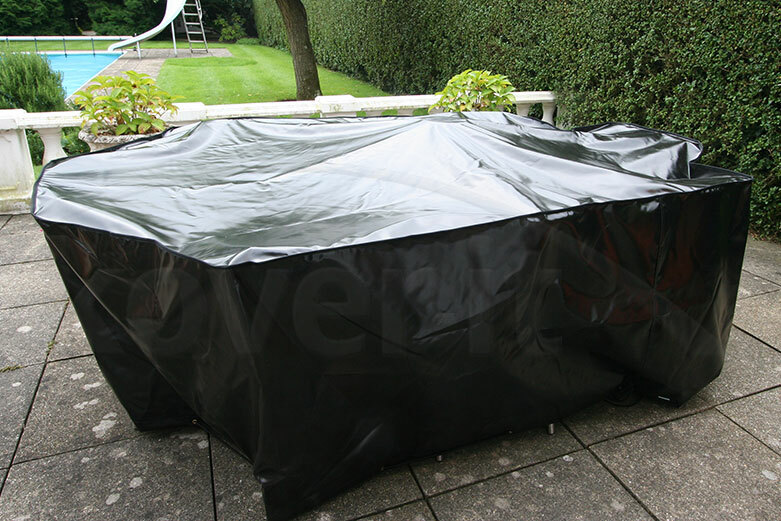 This prevents water from pooling, and allows water to run down and off of the waterproof cover. For the Patio Set below the customer used these two boxes under the cover to prop it up, with a towel underneath to protect the glass. For some Wicker Patio Set Covers we add mesh panels in the bottom to allow better air flow to the garden furniture; this isn’t standard in our PVC-ST covers, as breathability has never been a problem as some air gets underneath anyway, however customers can have this as an option. The mesh is put at the bottom in the drop neatly so water flows down and over the mesh, it is a very fine mesh so no insects or vermin can get in however lets a lot of air flow through. The mesh is also water resistant, although it is not completely waterproof when pressure of water is applied, because the mesh is in the drop water just runs down and over the mesh. 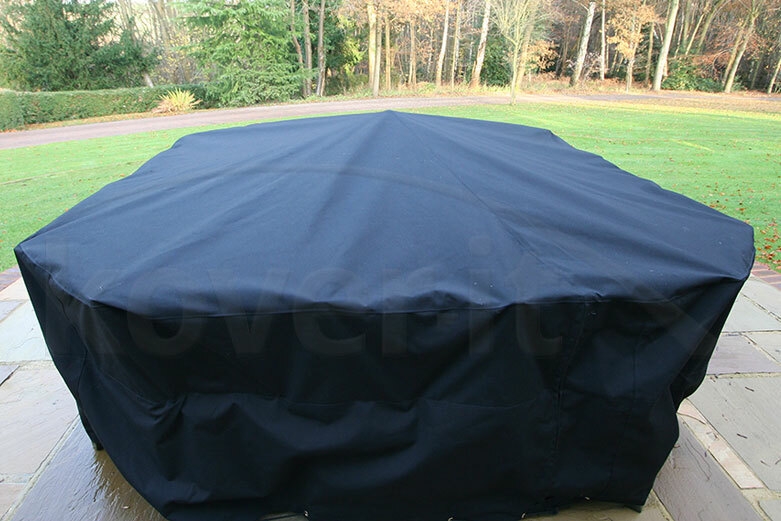 Below you can see Kover-it’s highly protective Waterproof Breathable Patio Set Cover protecting the Patio Set. Another textile Kover-it uses to manufacture high quality Patio Set Covers from is Sunbrella textile as where breath ability is essential for covers, such as on boats we recommend the Sunbrella Textile as it is completely breathable and waterproof, however unlike the PVC-ST it has a point at which its resistance to water is compromised. The Sunbrella textile is one of the best textiles used in the industry as it is acrylic solution dip dyed, meaning that its colour doesn’t fade, it is lightweight and comes in a variety of different colours and shades. The textile is very different to PVC-ST in its feel and its look, designers often prefer the Sunbrella textile for its aesthetics and breathability, however covers made from the textile do need a lot more looking after but only really after 8 years. In some cases the reason customers choose PVC-ST over Sunbrella can be because the PVC-ST is very heavy duty and at a lower cost than the Sunbrella, however Sunbrella is still a very strong textile and its superb breathability and designer look and feel makes it one of the best textiles to use in high quality outdoor protection. As you can see this custom made round Breathable Patio Set Cover fits the Patio Set well, and is highly protective. As well as being waterproof, strong and long lasting,the Sunbrella textile is also UV resistant, and has a resin based anti-fungi coating to prevent mould or mildew. All of Kover-its PVC-ST and Sunbrella Outdoor protective Covers come standard with eyelets and shock cord, as well as a 5 years guarantee, though nearly all of our covers have lasted customers 10 years plus. 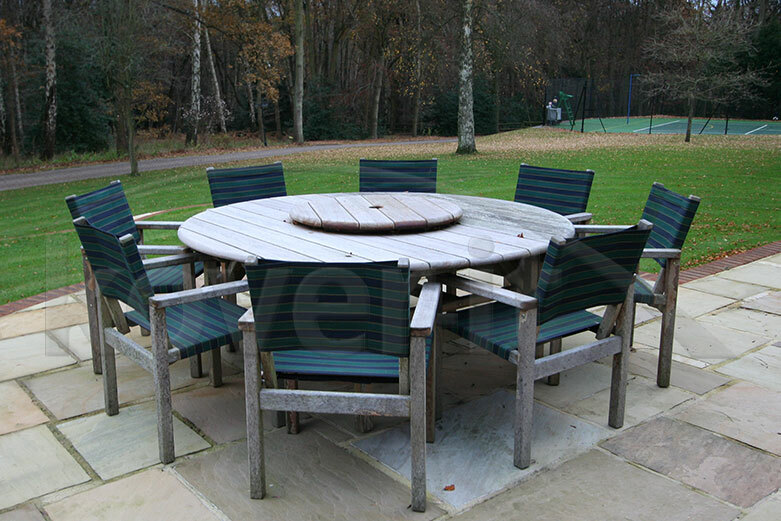 As well as manufacturing custom made patio set covers to customers measurements, Kover-it also stocks a range of standard sizes of heavy duty Round Patio Set Covers and heavy duty rectangular patio set covers on their website. 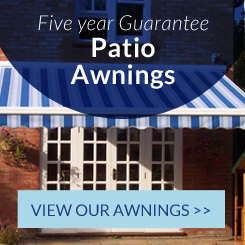 If you need any advise or any more information about Patio Set Covers you can ring Kover-it on 01189 406095, there friendly helpful team are happy to help. 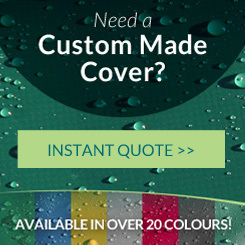 You can also get a quote for your custom made patio set cover using their website.